One sure way for our mailman to make my day is for him to leave a Pottery Barn, Pottery Barn Kids, or Ballard Designs catalog in our mailbox! I love browsing through the catalogs, pouring over the pages, and circling items I’d love to buy if I had a million dollars. But, let’s face it…I have Pottery Barn (and Ballard) taste on a Target budget! To remedy this, I have started creating “knock offs” of some of my favorite items from the design catalogs. One item that’s been in the Inspiration folder on my computer – doesn’t everyone have an Inspiration folder? – is the Pottery Barn Ruler Growth Chart. Sadly, they don’t sell it anymore…but that didn’t stop me from creating a “knock off”. 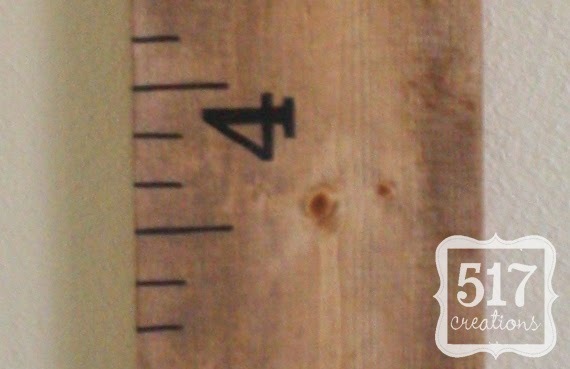 YOU CAN NOW PURCHASE OUR RULER GROWTH CHART IN OUR SHOP! Here is an updated post that answers more of the questions regarding making the growth chart, what pen I use, etc. This project ended up costing me a little under $7, because I had most of the supplies on hand. The only thing I had to purchase was a 1 x 8 x 6 board from Lowe’s. I stained the board with Walnut stain, giving it 2 coats and letting it dry in between coats. I brushed the stain on with a paint brush and then wiped most of it off with a rag. I wanted a vintage, aged look, so I wasn’t too careful with making sure the coats were even. After letting it dry for 4-6 hours (per the instructions on the can), I brought it in the house to tackle making this stained piece of wood look like a ruler. I pulled out a pencil, a ballpoint pen, my acrylic ruler, and a paint pen. This is where it gets a little tricky, but it’s worth it! One more thing – I started marking off my “ruler” at 6 inches, because I wanted to be able to hang it on the wall. If you’d rather rest it on the floor, start marking at 1 inch. So, my 6 foot board ends up looking more like a 6 ½ foot “ruler”. I wanted the numbers to look authentic, so I found a font that I liked (Century) and printed out the numbers 1-6 in 200 point font. I rubbed a pencil on the back of the numbers, placed the numbers where I liked, and traced the numbers with my ballpoint pen. This left a slight indention and pencil lines on the actual board. I simply filled that outline in with my paint pen. It requires a little bit of a steady hand, but you’ll get the hang of it! After I created my “ruler”, I sprayed the entire board with a clear coat to protect my work. This still allows me to measure my son’s height and mark on it, but gives it a finished look. To hang it, I simply attached a sawtooth picture hanger to the back and hung it on a nail in our playroom. It’s not very heavy, so it didn’t take much to hold it. But, if you have a particularly rowdy crew, or want to hang it in a more high traffic area, you might consider attaching it a little more permanently to the wall. Using a measuring tape, I made sure that the Ruler Growth Chart was hung on the wall at an accurate height. This way Grayson can just stand in front of the ruler to measure his height, much like you’d do on a wall at your house. **Disclaimer: This tutorial is for personal use ONLY. Please do not use this tutorial for monetary gain. This is wonderful. You did a fantastic job. I am insipred! Super cool. I want to make one too! I'm sure your tutorial will make it easy. I love it! Such a great idea and your execution was perfect. LOVE this! this is one of the few 'knock-offs' that i genuinely like a LOT more than the original. Awesome job!!! Great job! I have been wanting one of these myself and I am going to follow your tutorial. Thanks for sharing. Hi, I think the ruler is awesome, but I'm also really interested in the ABC/animal pictures on the wall in your playroom. I'd love to do something like that in our nursery. Would you mind telling me how you did it...did you buy them like that or print pictures yourself? How did you attach them to the wall? thanks so much! I can check your blog later or you can write me at jennywhiting at gmail.com THANKS! This is really a great idea and a great job - love the look of it on the wall too. Your lines and numbers are really clean and crisp. Love it! this is totally brill! thanks for posting and inspiring! where did you get your paint pen? Is it from a craft store or home improvement store? I've never seen them before. What do you use to mark his height on it? It's permanent, waterproof, and doesn't bleed like a Sharpie! I like yours even better than the Pottery Barn one....very inspiring!! We are trying to do this and our paint pen bleeds but it isn't a "superfine" one. We will try with that next! I saw these all over Pinterest and I totally went out and bought some wood to make one too. I hadn't finished it yet thought because I was getting all hung up (no pun intended) on where to start my marks, but after seeing yours, I'm starting mine six inches up too. Yours is WAAAAAAY better than the PB original! Huzzah for DIY mamas! Thanks for sharing. I'm TOTALLY doing this for my little boy's room! I went and bought my board today, hopefully I will get it done this week once I finalize the colour I want! Thanks for sharing this project, and I reblogged it with credit. very cool idea! I love this! I think yours looks better than the one from pottery barn! Great job! Much better than the original. Great tutorial. Thanks! I've seen these at the store but never realized they once sold them. It never ocurred to me I could make one, either. I will now!! I know exactly what I'll make the numbers with. A few months ago I brought home some boxes I had at my moms. They have items I used in high school and college for homework and stuff. Well, among them there's some number stencils that were my grandpa's. The numbers are a cool, retro style. I've been thinking about what to use them for. I think they'll go great in the ruler. I just made the growth ruler according to your directions and it looks great! Thanks for the idea! What did you use as a "clear coat"? That is the only thing I have left. AMAZING! I have no skills but your instructions are so detailed that I so think I can do this! I am searching for projects from Pintrest to complete in 100 days. This is so going on my list! LOVE it!!!! Yours looks better than PB's! Thanks for telling how you did it all. This method helps a lot since I don't own a cricuit. Maybe I'm lame, but how exactly did you get the big numbers on there? I like your better than PB! I have been SEARCHING for a great growth chart idea...THANK YOU!!! Just wanted to let you know I used your tutorial and love how it came out! Will be posting pictures of it tomorrow with a link back to your site! I love this! We are a military family and move around a lot. I love that this will move with us. Copied your idea and posted here. Found this on Pinterest and copied it as well. Thanks for the cute idea! I love this idea,and it is now on my project "list", but I really love the alphabet posters on the wall! Where did you get them? 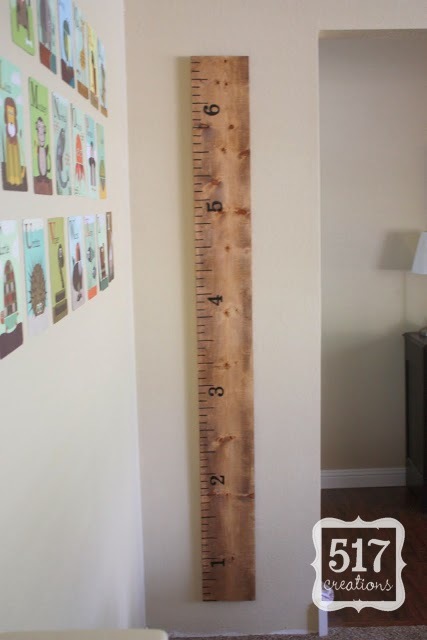 I loved this growth chart, so set out to make one myself. I always like to share with the person who gave me the idea. If you want, feel free to go have a look/see my copy of yours. I have the actual PB one but I sure wish I saw this idea way back when!! It is wonderful and I am making one for my niece and her little boy for Christmas! Thank you so much for sharing!!! You should submit this to KnockOffDecor.com. I am TOTALLY going to make this. Thank you so much for the inspiration! I made the board this week. I tried using polyeurethane (the kind you paint on) and it made the paint pen bleed/smear even after it dried for a whole day. I only went over about 5" of the board with it but I was able to wipe off and the ruined number and lines and redo them. Go the SPRAY route if you are sealing it! Love this idea, and am planning to make one for our house soon. I'm your newest follower--Happy New Year! We are moving into a new house tomorrow and I can't wait to make this for our toy room! Thanks for the inspiration! Thanks for the inspiration, we just finished this project and I *love* it, and so does my daughter! what size are the numbers? thx! Thank you so much for this great post - i referenced it multiple times when I was making my www.thnxpinterest.com project. I followed your steps almost exactly although I found my own way to make sure that the lines were all the same length and the numbers straight (using painters tape) - http://thnxpinterest.com/2012/02/06/thnx-pinterest-u-growth-chart/ I also gave you a special Thnx call out in the post! Way to go! What a great idea - I've been looking for a growth chart & they are just wayyyy out of my price range right now. This I can DO! Yay! THANK YOU for creating this! It's wonderful! I got my board today, will get my hubby to help with stain colors and get started. I can't wait! After you seal with the clear coat, what are you using to record height and dates on the board? I am trying to figure out what will actually work since the clear coat is supposed to prevent marks, etc. right? PLEASE help with any ideas. Thanks again! I NEVER comment on anything posted (and I am an avid crafter), but I just had to for this! This is such a creative idea, so well done, so simple and affordable. I have to also commend you on your details in your steps- very easy to follow! I can't wait to do this myself! Aack!! Made a mistake with the sharpie, any remedies to remove it other than starting all over??? Have you tried sanding it down to remove the Sharpie? I am not really sure as I use a paint pen, so the paint "sits" on top of the stain and is easily removed when sanding. The Sharpie might blend in/sink in to the wood. Hope you found a solution! But, I only stained one side and did not seal it. Did anyone elses warp? I am thinking lack of sealer may of caused this issue. Would really like to know cause I want to make another. Thank you!! Hi Beth! Do you live in an especially humid climate? I am guessing that not sealing it may have contributed to it warping. I have had ours hanging on our wall for just over a year and it's still perfectly straight. Anyone else have a suggestion?? Thanks so much for a great tutorial, you guys are awesome! hi, thanks for this inspiration -- i knew i had to have one for my little guy!! thanks for the great tutorial, i featured on my blog with a mention of your site! I am making this for my niece's first Birthday! My brother and his wife just moved into a new home and their playroom is vintage school style. This will be PERFECT. Thanks so much! Hi there....Love this project and even though I'm not "crafty" in the slightest, I'm going to attempt this one for mh son's playroom. The end of the instructions say that spray the chart with a clear coat. So, I have a stupid question..."Clear coat of what?" I usually use a Premium Enamel Spray in a Clear Gloss from Ace Hardware (Here's a link: http://www.acehardwareoutlet.com/ProductDetails.aspx?SKU=17007) but any type of clear sealer should work! The only thing I would caution is to be sure that your sealer won't cause your paint pen to run. I use an acrylic paint pen (so it's water-based, not oil-based) and it works great, but I've heard that you should be cautious when using a sealer on top of a Sharpie or oil-based paint pen. "I made the board this week. I tried using polyurethane (the kind you paint on) and it made the paint pen bleed/smear even after it dried for a whole day. I only went over about 5" of the board with it but I was able to wipe off and the ruined number and lines and redo them. Go the SPRAY route if you are sealing it!" Bought my board and stain today, and I read your post about what pen to buy from Joann's for the height measurements. My question is about the paint pen...is there a specific pen I should use for this so it doesn't bleed? I haven't used paint pens before. I use "Painter's" Paint pens by Elmer's. You can find them in any craft store (Joann's, Michaels, Hobby Lobby, etc.). They contain acrylic paint, so it's just like using any acrylic craft paint and won't bleed when the sealer coat is used. I just finished painting my lines today. I went to an art store and bought 4 paint pens...2 Montanas in fine and extra fine and two Sharpie paint pens in Medium point and fine point. I decided to use the Montana fine paint pen for painting on the lines because the sharpie seemed to saturate the wood a little more and looked more like a marker and less like paint to me. So far I like the result. Now I just have to make sure that I can get the numbers on and looking good! I'd like it to turn out just like the original posters chart. Does anyone have any ideas as to how to make a easy stencils for the numbers? I was going to make my own using a plastic sheet and an exacto knife....but getting all that stuff together when I work 60+ hours a weeks sounds daunting and I'm soooooo close to finishing. I did this for another project, and it worked.... I actually printed the words/numbers from a computer. Then, I traced it with tissue paper (pencil). I took the tissue paper to the project, and retraced it with a very fine sharpie. It slightly bled through and left a faint outline that I filled in. Since sharpie is not advised you could try pencil- but the concept may work for other future projects. I totally did the same thing! I showed my father and he was like I can do that! Give me that magazine! And within our visit to grandpas we had our ruler growth chart. My so and I rent, so no permanate home, this is perfect and goes with almost any design scene. 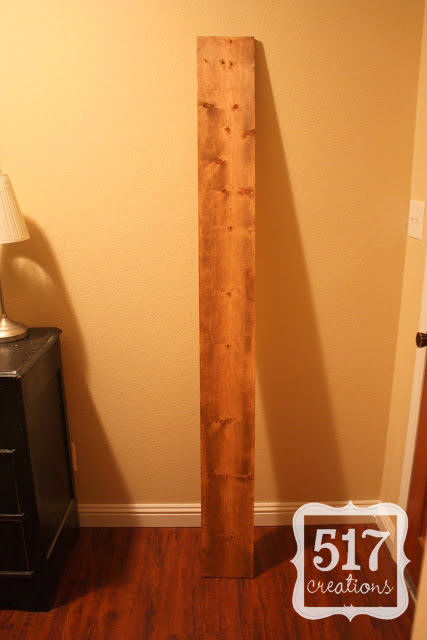 Thanks for the DIY on making such a neat growth chart! I included a link to your tutorial on my latest blog post about decorative growth charts! I JUST finished making my own! I'm so glad I stumbled across this; thank you!!! Thanks again for this! Made my own, and posted a review of your tutorial today. I am confused. Which pen is which? You have both the Painter's pen by Elmers and then the Faber-Castell Pitt Artist Superfine Pen. Which one do you actually make the ruler with before the clear coat? Can you tell me how you got the 200pt font? Hi, I have the MinWax Polyshades stain. It's one-step stain (i.e. stain with polyurethane in one). Would I still be able to mark the numbers and dashes on it AFTER applying the stain??? What did you use? I'm wondering if I will be able to write my kids heights and ages on this after it is completed? What kind of pen can I use? Thank you for giving us all the vision and the tools to complete this wonderful growth chart. I finished mine yesterday and I wanted to let you know it could not have happened without your tutorial! I linked back to your page... was so happy to find a tutorial for these that did it by hand and not stencils. This was my favorite Christmas gift for our family. Thanks for sharing!!! Hi there! Stumbled across your blog and love it! A few months back I asked my husband to help me make one for our boys and we had fun preparing the board, but got stuck on creating a neat, professional way to put on numbers and tick marks. We tried numerous methods, and weren't happy with any of them, so decided to design a DIY vinyl decal that you can just transfer onto the board and were finally happy with it! Maybe it will be a help to others out there! What kind of paint pen did you use? I just use a regular acrylic paint pen. You can find a store brand at Michael's or several stores carry a "Painter's" brand. Hope that helps! HELP! I just stained my board with Minwax "Special Walnut" oil based stain. I brushed on and wiped off right away. It's way too dark! Unfortunately, I know nothing about woodworking/staining. Do you know if I need to sand the whole thing down and start over with a lighter stain? I'm hoping it will dry lighter but since it's oil based, I'm thinking it won't. Hmm...it probably won't dry lighter and will actually deepen in color once you put a sealer on it. You might try sanding it lightly - this will lighten up the color as it takes some of the stain/wood away! Hope that helped!! I absolutely love this! SO happy a friend pinned it on Pinterest! Thank you for such a great idea to DIY! I just made my supply list and am hoping to do this this weekend for my boys! Which, by the way, my oldest's name is Grayson too! Loving your blog! Thanks so much again! Love this growth chart and plan on making it this week! :D Just wondered if you used a fine tip paint marker or medium? Thanks for the tutorial! I really appreciated the tutorial, especially about how you did the numbering. It worked like a charm and my whole project turned out better then I hoped! Thank you. I actually like yours so much better than the Pottery Barn one! Nice job! Thanks so much for taking the time to do a tutorial and publish it so we can all copy! I love it!!!!!! Thank you for this! I just finished and can't wait to hang it on the wall!